Casa Duse echoes the immortals that resonate and greet but never haunt this virtual museum of past treasures. Adorning the walls are autographed photos of theatre greats such as Laurence Olivier, John Gielgud, Noel Coward, Eleanora Duse and Charlie Chaplin, as well as opera luminaries, including tenor Enrico Caruso, composer Giuseppe Verdi, conductor Arturo Toscanini, Zinka Milanov, Joan Sutherland (“La Stupenda” to her fans) and her spouse, conductor Richard Bonynge, who were Waldron’s house guests and resided in the Casa Duse for several years. 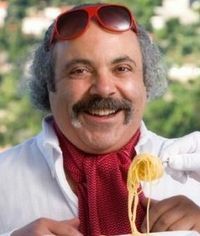 Luciano Pavarotti, Sheryl Milnes, Leonard Warren, Alfredo Krauss and many other operatic glitterati were frequent guests. It should be noted that Sutherland and Pavarotti, on their way to Casa Duse, got their birthday cakes from Monteleone’s Bakery, which is still on Court and President streets. The great tenor would order cannolis (incognito) and devour them in his stretch limo parked outside. He and Sutherland sent an autographed photo of appreciation to Monteleone’s, which was on exhibit for many years. Monteleone’s is now managed by Antonio and Maria Fiorentino and family. After “Oberon’s Hors D’Oevres,” which included a roasted cherry tomato and goat cheese tartlet, garlic and smoked salmon, wines and libations, two tables were set up opposite each other across the elegant room with vines decorated with flashing lights like mini stars. The cast performed as we dined. We sat with esteemed playwright Mario Fratti (Nine) Verdi scholar and filmmaker; August Ventura; Anthony Ungaro from New Jersey Opera and his wife Susan, who is President of the James Beard Foundation; and Francesca and Anthony, parents of actor Matthew Cohn with friend Steven. The members of the New Place Players (named after Shakespeare’s home in Stratford-upon-Avon, England) were all inspired by this multi-layered romantic comedy presented through the courtesy of Actors Equity. The play, believed to have been written in the 1590s, takes place mostly in the forest, which is controlled by fairies who manipulate six amateur actors. The action unfolds with the events of the marriage of Theseus, the Duke of Athens and Hippolyta, Queen of the Amazons. Dual roles were played by Matthew Cohn, who was outstanding as Theseus, Duke of Athens and also as Oberon King of the Fairies. Lauren Shannon as Hippolyta, Queen of the Amazons, also sparkled as Titania, Queen of the Fairies. Adam Patterson reveled in the roles of the impish Puck, Philostrate, Master of Revels and Robin Goodfellow. A truly outstanding performance by Emilio Tirado as Nick Bottom, a weaver, and his transformation to a jackass had an unforgettable, poignant panache to it. We enjoyed seeing Craig Bacon as Robin Starveling, a tailor. The four young mismatched lovers were Aaron McDaniel as Lysander, in love with Hermia; Will Gallacher as Demetrius, in love with Hermia; Heather Boaz as Hermia, in love with Lysander; and Olivia Osol as Helena, in love with Demetrius. Matthew Augenbaugh played Egeus, Hermia’s father, who wants her to marry Demetrius. If she refuses, she must enter a nunnery, as is an ancient Athenian law. Titania’s fairies and musicians were Niki Pankovits as Peaseblossom, Charlotte Mundy as Cobweb, composer Flavio Gaete as Mustardseed and Snug, a joiner. Morgan Auld was Peter Quince, a carpenter; John Wahl played Francis Flute, a bellows-mender; and Matthew Augenbaugh was Tom Snout, a tinker. The music by Flavio Gaete was haunting, and Felix Mendelssohn’s bridal song, recorded by Claudio Abbado and the Berlin Philharmonic, added to the felicitous celebrations. The use of sock and stick puppets (cloth and light) throughout was ingenious. James Ortiz, with Molly Siedel and Mira Veikley, provided wonderful costumes and puppet design. The stunning graphic design was by Yne Leal. 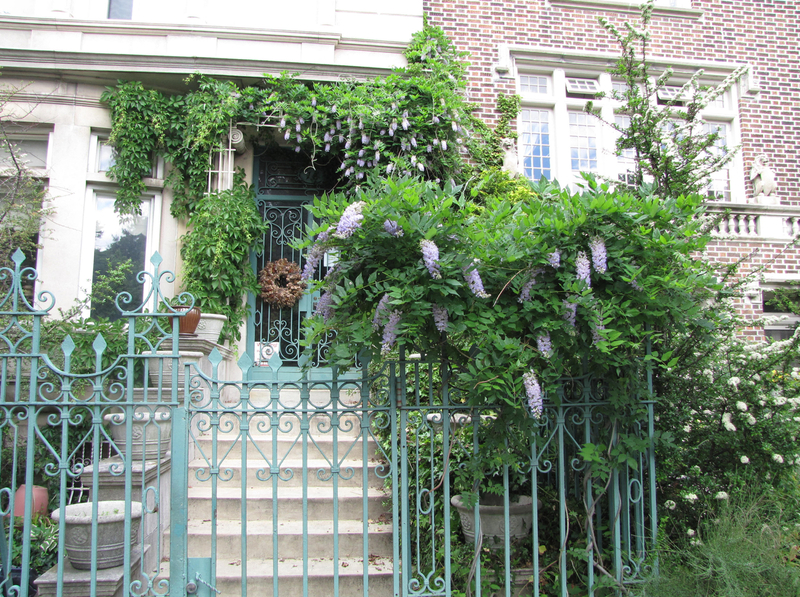 Floral and bower design by Jeanne Cameron added to the enchantment. Production and stage managers were Rebecca Pickett and Abigail Strange. Between the acts, we were served “Hippolyta’s” herb-marinated grilled shrimp with ciabatta and savory sauces with herb butter. The second course was “Titania’s” heirloom tomato gazpacho with avocado and cilantro oil. The main course was “Bottom’s” chianti braised boneless (tender) beef with a farro risotto, shibumi mushrooms and sautéed broccoli rabe. A salad followed of “Puck’s” blue moon acres arugula with currants, pine nuts with shaved reggiano parmesan cheese and citrus vinaigrette. Chef Max Hansen’s final offering was “The Lovers,” individual fruit Napoleons with puff pastry crisps and a brown sugar whipped cream and raspberries, blackberries and blueberries awaiting one’s palate like sacrificial offerings. Fresh brewed coffees and herbal teas aided and abetted this phenomenal food finale. Our wine glasses were refilled frequently! Great food, great Shakespeare and excellent company offered a remarkable respite from a troubled world. We thank the New Place Players with directors Craig Bacon and James Ortiz and super chef Max Hansen for making the Casa Duse Supper Club a continuing place for such soirees. It was “a moveable feast” of stimulation, illumination and sensation, as we gravitated toward the light only such magical evenings can provide. 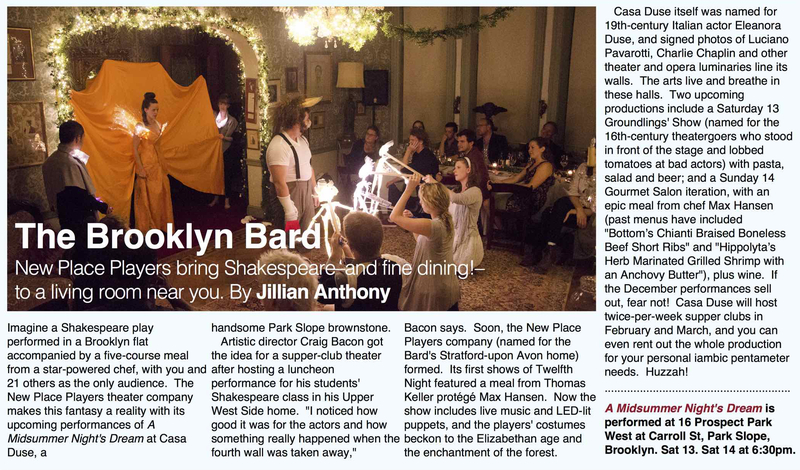 New Place Players are available for private soirees, business conferences, alternating with Shakespeare’s “Twelfth Night” and a gourmet meal. The Casa Duse Supper Club was the perfect venue on both Sept. 10 and 11 with a different chef and meal at each event. Let me tell you a true story that sounds like an opera with music by a verismo composer and a libretto fashioned from the writings of Charles Dickens, Gabriele D’Annunzio and Damon Runyon. Its star is Martin Waldron, an only-in-New York character whose stately Brooklyn townhouse was a haven for opera stars and noble actors. Although he has gone to commune with the ancient muses who inspired him, Waldron’s own spirit still makes an occasional apparition in the salon that he created. In the winter of 1921, Mary Waldron, an unmarried woman in her ninth month of pregnancy, was put on the RSS Carmaniain Ireland by her family who were ashamed of her. The ship was destined for America, where Mary was to find distant relatives to take her in. As it happened, the baby came sooner than expected. Mary delivered a son on February 22 at 10:10 pm. His place of birth was described by the coordinates at sea: Latitude 47.37 N Longitude 31.16 W. Mary named her son Carman Martin Waldron, with his first name adapted from the ship on which he was born. When the ship reached New York, Mary felt she could barely take care of herself, let alone a newborn, so she put the baby up for adoption. He was taken by Joe and Maria Geraci, who named him Robert Geraci and brought him home to their apartment on Manhattan’s Lower East Side. An important presence in the boy’s life was his new Sicilian grandmother, Maria Catania. The boy’s grandmother introduced him to opera through old shellac recordings and later took him to the old Met, where he was enchanted by the heightened theatricality combined with truthful moments through gesture and facial expressions. And he loved the music and the voices! Martin (still called Robert) showed some aptitude for using his voice. He was taken to the formidable baritone Giuseppe De Luca, who trained him in singing, breath support and vocal production. De Luca had one of the greatest bel canto techniques ever and his young pupil absorbed them well. For a time, the boy was in the Met’s children’s chorus, gaining exposure to opera repertory, languages, life on the stage, and proximity to some of the greatest stars as they sang. Like many kids in the Met chorus, he discovered he did not have the combination of gifts to pursue a performing career in opera. But his particular combination of influences and interests propelled him toward a career in spoken theater, specifically the classics that Duse, the Barrymores and other thespians had as their core repertory. In his 20s, Martin studied with Sanford Meisner at the Neighborhood Playhouse and fully embraced his teacher’s dictum, “Acting is behaving truthfully under imaginary circumstances.” This struck many chords in him, one of which was to be truthful about who he was. Although he loved and was grateful for the Italian family that raised him, he went in search of his roots and took the name Martin Carman Waldron, making the vessel of his birth his middle name. Martin was proud of the fact that his voice was so well-supported that his cheering could be heard throughout the Metropolitan Opera House. He delighted in a letter (framed in his home) from Milanov’s secretary regretfully telling him that he had to yell brava! more quietly when Milanov sang. 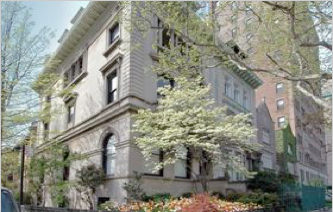 In 1958, Martin acquired a townhouse on Brooklyn’s Prospect Park West built in 1896. He named it Casa Duse, treating it not only as his home but as a gathering place for actors and opera people. And this is how I met Martin in 1982. 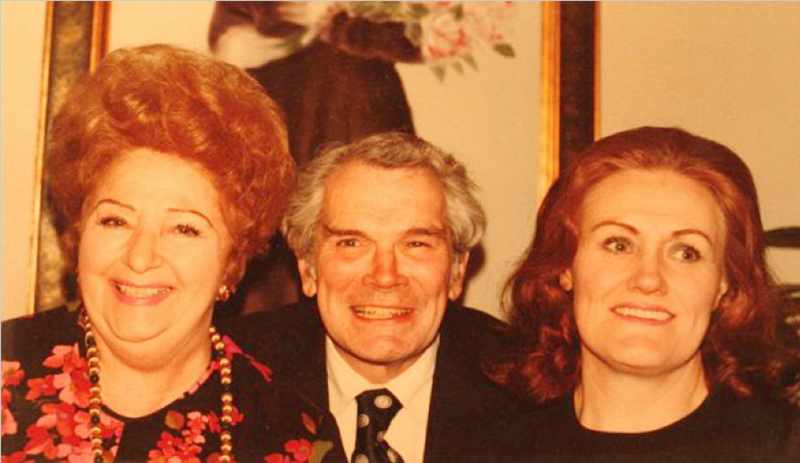 Joan Sutherland and Richard Bonynge returned to the Met for a phenomenal run of Lucia di Lammermoor when I worked there as performance manager. Martin sought me out, introduced me to the Bonynges and then confided to me that they lived with him at Casa Duse. Here is a performance of Lucia conducted by Bonynge and starring Sutherland on New Year’s Eve 1966. Martin told me it was perhaps the greatest he had ever heard. Until his death in 2009, Martin passionately taught and attended theater and opera when there were “the great ones” on the stage. His home was a salon of the theatrical and musical arts, past and present. It was not a museum but a place where actors and opera people were made welcome. This salon is being continued by Krakovski, who lives in the house. Recently I attended a performance there of A Midsummer Night’s Dream by a talented troupe called New Place Players as part of an evening that included a meal based on themes inspired by the play. He plans to have more theater events and expand to music and opera. Krakovski has established an e-mail address to build a mailing list for future events. 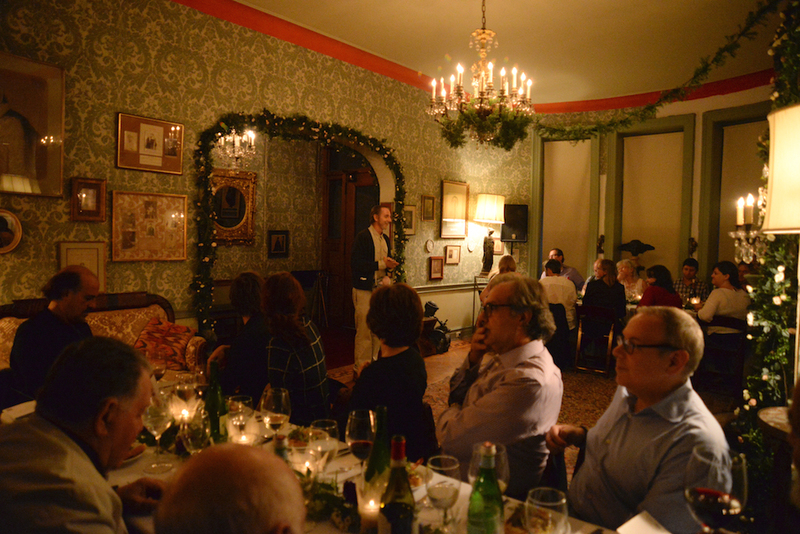 For many who attended the Shakespeare evening, it was the first time they set foot in Casa Duse. To them, the most remarkable thing was the home itself, with a room dedicated to Duse, many photos of theater and opera luminaries from the past and, above all, the spirit of Martin Waldron. The New Place Players, a troupe of Shakespearean performers-for-hire, have also been busy immersing audiences. 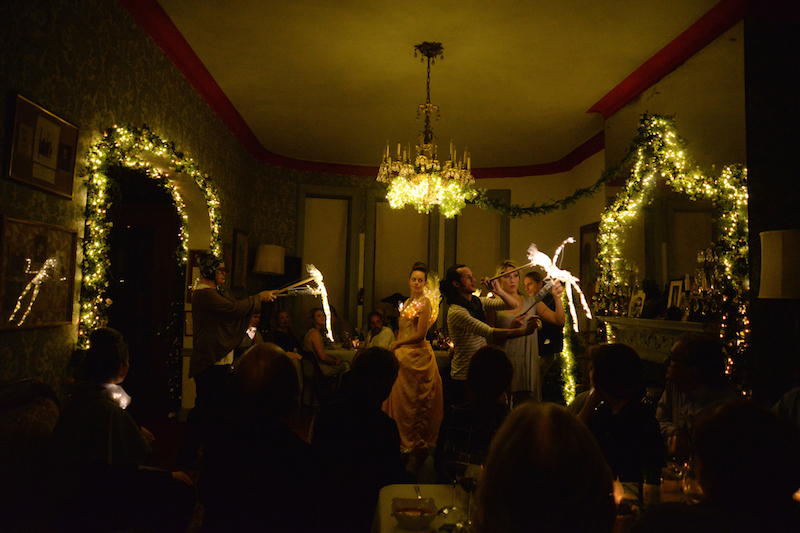 The group has staged their productions of Twelfth Night and A Midsummer Night’s Dream in homes all over the city, while also putting on regular supper-and-show performances in the sumptuous living room of the historic Casa Duse residence in Park Slope, Brooklyn. The productions are a harmonious blend of music, lighting, theatre, food and drink, amounting to a communal atmosphere that harks back to the experience of catching a theatre performance in Elizabethan times. 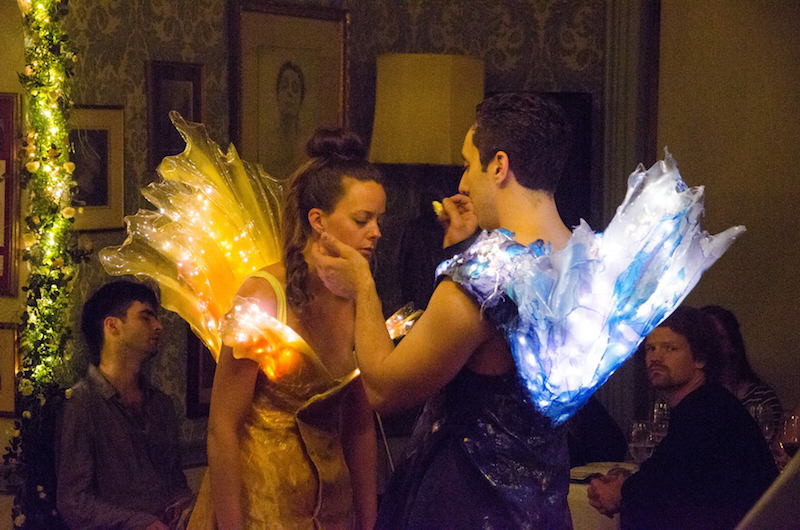 “This is our version of a sensuous Elizabethan feast,” says director Craig Bacon. 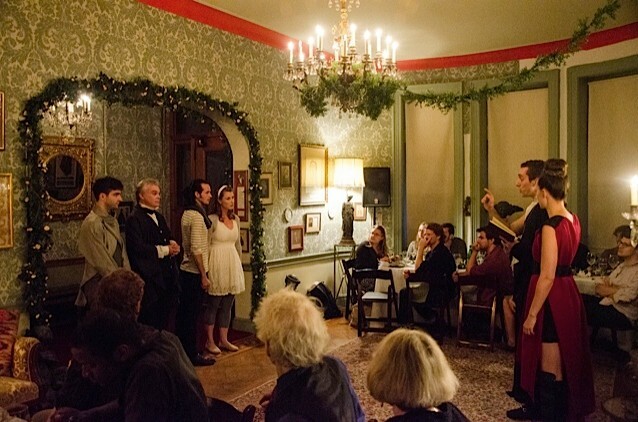 Reflecting the give and take between actor and audience in Elizabethan times (“If you weren’t careful things might have been thrown at you,” Bacon says), the New Place Players emphasize the sense of actor and audience sharing the same space, with only the subtlest of fourth-wall-breaking antics. It would seem that this very energy is increasingly being discovered in people’s private spaces for the enjoyment of the relative few. The irony, of course, is that the more these events appeal to New Yorkers’ desire to attend exclusive gatherings of only the most in-the-know types, the more popular these events will become – the perfect excuse to get into someone’s personal space as soon as possible.